of the United States is remembered by Midwesterners who knew him. A look at what lessons his life and his Presidency hold for us now. Few American Presidents have captured the fascination of the world as did John Fitzgerald Kennedy. Forty-two years ago this November after his death, it is still hard to view his life and Presidency objectively, and a kind of mystique (some would call it glamor) clings to his name. John Kennedy was known for his charisma, his brilliance and facile wit, his social idealism, courage and even heroism. He was widely loved and admired (an immensely popular world-figure rather than simply an American leader). His charismatic personality threw a rosy veil over the actualities of his brief 1,000 days in office, and offered, instead, the evocative and inspiring image of Camelot reborn  the Arthurian Romance transplanted to the White House. Seldom before, in a torn and divided world, had a political leader so ably succeeded in kindling peoples hopes for a brighter future. Today, a generation after he died, politicians of both parties still invoke his name as a talisman. Kennedy took office during one of the most turbulent times in our nations history. The Cold War between democracy and communism was intensifying, and the tension between the worlds two nuclear powers, the United States and the Soviet Union, was such that many Americans even built bomb shelters in their homes. In our cities, racial tension was rising. Growing numbers of blacks had begun to demonstrate for equal treatment under the law, and white segregationists promised to deny these rights, resorting to violence. From the first moments of his Presidency, Kennedy evoked a sense of security and a spirit of idealism which reassured Americans of their nations strengths and inspired them to serve their country and the world. From his personal experience, he knew the horrors of war and kept us largely at peace during the coldest days of the Cold War. Though it is fashionable today in certain political circles and amongst historical revisionists to dismiss John Kennedy as more image than substance, secret White House recordings that have been recently released dramatically refute this caricature of him. In more than 300 tapes of Kennedys meetings, 280 phone conversations and a number of recordings dictated by the late President for his memoirs, he emerges as a man of surprising gravitas, who was firmly in command, who was invariably a step ahead of everybody in the room. Kennedy was coolly analytical and incisive, wasnt afraid to challenge the advice he was getting  or even wholly disregard it  had a keenly developed sense of history and a vision for tomorrow, was an idealist but political pragmatist. He skillfully guided his countrymen through treacherous terrain where the simplest misstep could have provoked a nuclear exchange with Russia. He set priorities that were worthy of a great nation, and displayed qualities of leadership and even personal courage that have been sorely lacking in the Oval Office in recent times. Of Irish descent, Jack Kennedy was born in Brookline, Massachusetts, on May 29, 1917. His parents, Joseph and Rose, who then occupied a rather modest home, wanted their eight children to have broad exposure to the world, an understanding of what it was like, and the diverse experiences it offered. As Joe Kennedys wealth and political fortunes increased, the children were able to pursue what Rose described as learning experiences. She also kindled in young John an early interest in history, by taking him to Plymouth Rock and the Old North Church. Growing up in the bustling Kennedy household meant much was expected of him, a competitive streak was fostered in all the kids, and dinner table discussions about current events were routinely encouraged among family members. Outsiders were frequently invited into the home to share their various points of view. Jack attended the London School of Economics for a year, and later Harvard, where he was a lackluster student, graduating in 1940. He meandered through pre-war Europe, then joined the Navy, even though he could easily have avoided service due to his multitudinous illnesses, which afflicted him throughout his life. Though he was already a millionaire heir, society figure, and ambassadors son, Kennedy was assigned the dangerous mission of commanding a patrol boat, pt-109, in the Pacific. On the moonless night of Aug. 1, 1943, a Japanese destroyer appeared out of nowhere and collided with his boat, killing two of his men and sending 26-year-old skipper John f. Kennedy into fiery waters to save his crew. Despite a back injury, he swam five miles to a desserted island, pulling an injured crewman with a rope clenched in his teeth. The following days saw several fearless attempts to be rescued. The men were weary with starvation and thirst, when they were eventually saved a week later by Solomon Islanders loyal to the Allies. After the death of his older brother, Joe, in World War II, his fathers ambitions fell upon him, and he lived out those expectations through a drive for political prominence. After the war, Jack toured post-war Europe at age 28 as a reporter for Hearst newspapers. While waging a successful campaign as the Democratic nominee for Congress from Boston in 1946, he refused to allow himself to be portrayed as a war hero, though he surely was one. In speaking to a group of Gold Star Mothers, he said only that he understood what they were going through, because his Mother also had lost a son in the war. John Kennedy advanced in 1953 to the u.s. Senate and married the glamorous Jacqueline Bouvier on September 12th of that year. In 1955, while recuperating from a back operation, he wrote Profiles in Courge, winning the Pulitzer Prize in history. In his debates with Richard Nixon, JFK dispelled fears among some voters that in being so youthful, he was not up to the challenges of the Presidency. Despite Kennedys soaring rhetoric, for years various biographers have singled out Kennedys assistant Ted Sorenson, a Nebraska native, as the chief author of the inaugural address  a task he supposedly accomplished in collaboration with various advisers. But Thurston Clarke, author of The Inauguration of John f. Kennedy and the Speech That Changed America, debunks this myth. Using previously unavailable documentation, Clarke shows that Kennedy wrote his own speech. 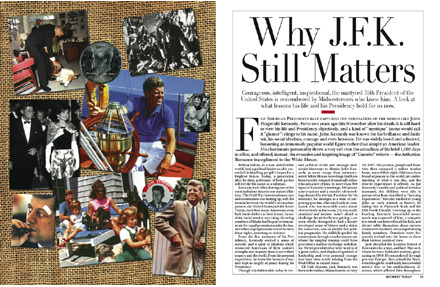 Though in distressing physical pain from his back problems, JFK  who was the second-youngest President in U.S. history  projected a remarkably youthful vitality and vigah. He emphasized physical fitness, and his appeal to the younger generation was immense. John Kennedy was the first u.s. Pre-sident born in the 20th century, the first of the Catholic faith, the first to grasp the power of television and use it with skill and force, the first to reach out to space, the first to face with equanimity the age of mutually assured nuclear destruction. It seems that Kennedy was never at a loss for inspiration, and that his greatest ideas, such as the Alliance for Progress, the Peace Corps, extensive civil rights legislation, and the Nuclear Test-Ban Treaty, were all part of a process of easing national and world tensions. The power, scope and assertiveness of Kennedys brilliant mind were also seen in both his sparkling eloquence and ready wit. He was said to be able to read at a phenomenally rapid rate, a page at a time, 1,200 words per minute. Even in the Presidency he consumed ten or 12 books a week. A newsstand vendor near the White House reported his business had gone up 400%, due to all the magazines and papers that JFK wanted. Yet it seemed to be his underlying mission to unite the American people in support of its highest ideals, to remove the tarnish from the practice of government, and re-emphasize the soul-principles upon which this nation was founded. In his own character, the contrast between the ideal and the actual was sometimes stark, but those who loved him appreciated the opportunity to think about their leader and their own possibilities in more beautiful and cultured terms. And this, JFK and his wife, Jacqueline Bouvier Kennedy, made possible. One Midwestener who knew Jack Kennedy from his earliest days was Pulitzer prize-winning historian and author Arthur Schlesinger from Columbus, Ohio. He remembers, his curiosity was unlimited. The restless thrust of his mind never abated. He not-iced everything, responded to everything, forgot nothing. Kennedys economic programs launched the country on the longest sustained expansion since World War ii. He laid plans for a massive assault on deprivation and poverty. He embraced the com-mon laborer and helped farmers achieve a better income. He addressed job re-training and chronic unemployment, and proposed a far-reaching revision of public welfare laws. Schlesinger reflected, He could never understand the complacent rich who, so long as they had everything they needed for themselves, were content to starve schools, medical services and social services for their less fortunate fellow citizens. He visited Appalachia. Kennedy brought aid to middle in-come families and mass transit, increased urban renewal and elderly housing. He created the National Seashore Parks. He helped protect families against u-tested and ineffective drugs, funded higher education classrooms, endowed the arts, and launched the first major national drive against mental illness and mental retardation. He put the power of the federal government on the side of civil rights when racial tensions escalated into violence in the South. In the foreign policy realm, he learned a bitter lesson early in his term. Jfk had given tacit approval to a covert plan involving Cuban exiles and an attempt to overthrow Fidel Castro. The Bay of Pigs was a disaster. Kennedy did not shirk responsibility, and at a press conference acknowledged his mistakes. The President and his brother, Bobby, the Attorney General, also quietly raised private funds to secure the release of men captured during the abortive invasion. White House tapes show, when facing crises over Berlin and Cuba, he was cool, analytical and restrained  leading this country with a firm hand and sound judgment through very dangerous times. All his faculties of judgment and leadership would be tested in what came to be known as the Cuban Missile Crisis. American reconnaissance had detected that the Soviets had moved nuclear missiles into Cuba, targeting the U.S. A wrong move at any point could provoke nuclear war. Kennedy resisted the clamor by certain members of Congress and the Joint Chiefs for a pre-emptive air strike. He challenged the advice he was getting, and asked probing questions. He impressively defused the crisis and the nation breathed a collective sigh of relief. His grasp of world affairs could also be seen in his frequent press conferences, which were invariably punctuated with his quick humor and even humility. Kennedys trademark rocking chair in the Oval office symbolized a man of contemplation. His glamourous wife, Jackie, and two children  Caroline and John-John  were picture-perfect. But Kennedys secretive extramarital affairs  with women ranging from secretaries to Hollywood starlets  were numerous, and even risky. There are also troubling questions about how members of organized crime may have helped in jfks election campaign even though his brother Bobby later pursued aggressive prosecution of crime figures. Kennedy was increasingly determined to resist the mounting pressure for an overt American military response in Vietnam, turning down his generals who wanted him to send the bombers and troops. Despite considerable concern about losing Vietnam from the Joint Chiefs of Staff and Secretary of Defense Robert Mc-Namara, Kennedys actions and statements toward the end of his Presidency are suggestive of a carefully managed stand-down from the sort of involvement that occurred under his successor, LBJ. Walter Cronkite, who had done a Hyannis Port interview with JFK in the Summer of 1963, told Midwest Today that I think he was very disgusted with the situation by that point  the failure of the Vietnamese governments to show any inclinations toward creating a democracy. Tapes of White House conversations on October 2, 1963 show Kennedy beginning the process to withdraw American troops from Vietnam before the end of that year. He signed off on the idea of reducing the exposure of American forces to guerilla combat situations. On Oct. 11, 1963, he directed the withdrawal of the first 1,000 U.S. forces from that country. His assassination assured that the military-industrial complex that even Eisenhower had worried about gained supremacy, and 58,000 American lives were lost in a futile war in Vietnam. Former President Gerald Ford, a Michigander, recalled that Across the hall from my old Congressional office was Jack Kennedys office. Although our parties differed, our priorities were much the same. We often walked over to the floor of the House together when the bells rang. Once there, we might go our separate ways, but we never sacrificed our friendship to our ambitions. John Kennedy was the most civilized President we have had since Jefferson. He had given the nation a new sense of itself  a new spirit, a new style, a new conception of its role and destiny. Had he lived, there would have been a more civilized, cultured discourse between members of society and between nations. He was a beacon of hope that the tawdriness of conventional politics could be transcended.